What should we make, for instance, of the explanations of each artifact—those small cards placed alongside the exhibit that give dates, functions, and analysis about the culture from which each work of material culture arose? Who found or dug up the piece? Where was it found and when? Was it reconstructed from pieces? Why is it in this particular museum in, say, London, Paris, or Germany, instead of a museum in Athens? 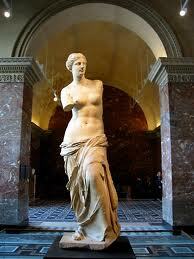 What asking these questions may reveal is that the statue with no arms (such as the famous “Venus de Milo,” at left, on exhibit at the Louvre in Paris, a Greek status of Aphrodite, found in 1820 and dating to around 100 BCE) does not exist in isolation. It is granted our time and our attention because of a particular frame of reference, such as the small plaque or card next to it, with an explanation as to why it matters or the parenthetical aside just above, telling us a little about the statue of Aphrodite). The blogger as much as the curator of the exhibit—through choices made in lighting, placement, security, wording, etc.,—tells us how “important” the work is and why we, today, should care about a statue with no arms. The point? Seeing the statue as worth taking a picture of, worth telling friends you saw, might tell us far more about the tourist’s relationship to the authority figure who wrote the card and placed the statue than it does about the marble beside which it sits. In this sense, the notion of “the past” is something that is constantly shaped to fit modern interpretations of something called “history” and our relation to it; and we, the modern interpreters and creators of these narratives about “the past,” can’t help but project our own interests and ideas onto what we think represents a stable, fixed, identifiable moment in time—a moment that we think somehow led from the past to us today. The starting point of this blog is the assumption that there’s no way to directly access a “perfect past” or, for that matter, to get the past perfected in the way we talk and think about it. With this blog, and in the trip we take to Greece, we therefore hope to be self-reflexive and pay attention to the ways in which our knowledge of both ancient and modern Greece, or what often gets called “Western civilization,” is always and necessarily edited and shaped by our own interests as well as the interests of those who present the past to us. To that end, the posts are categorized according to the modes by which we interact with the contemporary things that are given a place in tales of the past: we are “reading,” “walking,” “eating,” “exhibiting,” etc.